A Florida nail technician helped researchers develop a tracking device for endangered sea turtles. According to a report on PRI, a Florida nail technician helped researchers develop a tracking device for endangered sea turtles. “For conservationists, studying sea turtles has long presented a challenge. 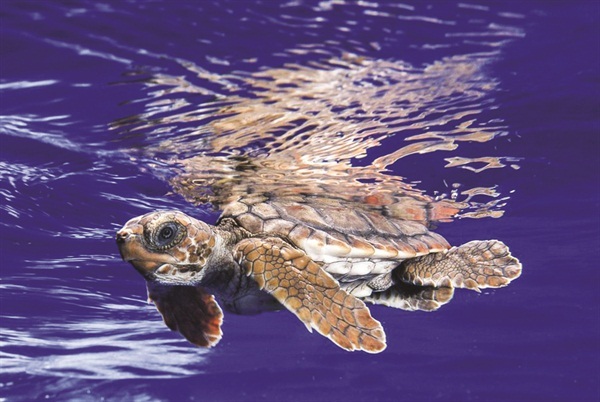 Newly hatched sea turtles disappear almost immediately into the deep waters of the ocean, becoming almost impossible to track and not reappearing for years,” writes Adam Wernick for PRI. Unable to successfully develop a system for tracking the newborn turtles in the open ocean, biologist Kate Mansfield of the UCF Marine Turtle Research Program and Florida Atlantic University professor Jeannette Wyneken received a suggestion from Marisol Marrero, a nail technician at Not Just Nails in Boynton, Fla.
Marrero asked Wyneken, an occasional customer, if she had considered using an acrylic base coat. It turns out, sea turtle shells are made from keratin just like fingernails. The researchers ended up using an acrylic nail base coat and hair extension glue to affix a solar-powered tracking device to the turtles — and it worked. “Mansfield and her team were able to track the turtles for two to three months, much longer than with any other device they had tried,” said the report. “It was fairly exciting because these data are the first for any in-water behavior, any information on how the turtles interact with their environments, and where they may be going on a broad scale,” said Dr. Mansfield.